Homeschooling is a huge responsibility. It can be hard to remember how big the responsibility is when we are in day to day mode. It is also one of the biggest blessings to be able to see your children learn and grow. If you have a chronic illness it can seem as though you might not be able to do a good enough job. While having a chronic illness does present some unique challenges, it in no way disqualifies you from the ability to homeschool. 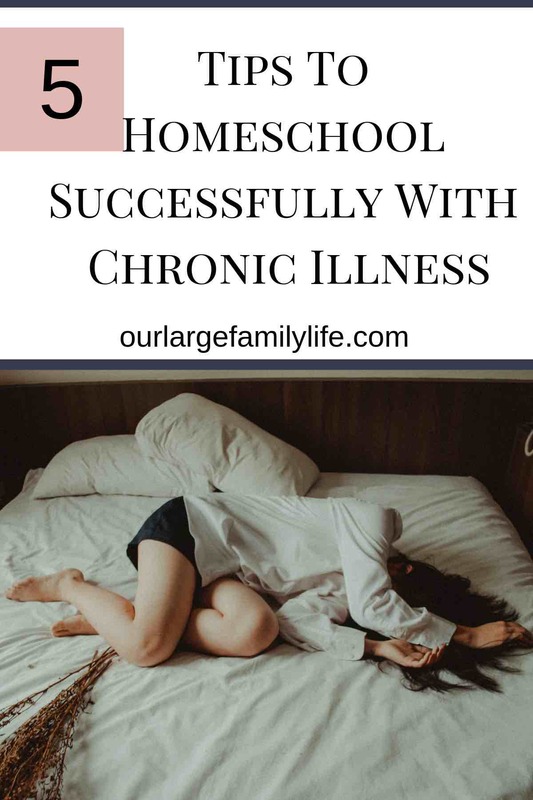 If you are looking at homeschooling or are currently struggling to make it happen with a chronic illness, here are some tips to help you be successful. Knowing your limits as it relates to your illness is the first thing you need to do. It will help you to make your decisions and prioritize better by knowing what you can and can not do. For me, it means if I do something very physically active (taking the kids on a walk, or on a bike ride) my energy level for the rest of the day will be tanked. I will not have the mental or physical energy to accomplish anything else, or if I do need to do other stuff it will be a lot harder. So the first step is figuring out what your limits are so you know how to organize your day to be able to get things done. When you are having a bad day or just need some down time to rest up for the next thing, these are activities that your kids can do instead of t.v. or video games. They will allow your kids to learn on their own, without even knowing they are learning. Schedules can be hard to keep if you don’t know how the day will go for you. Will you wake up feeling normal today? Is a flare up starting and you need to rest? That can throw a schedule right out the window, plus will leave you feeling frustrated and like your failing. What you can do though is create routines. If your kids have a routine in place it will be much easier for them to get their day started without you needing to be as involved. It will help them to be more independent. You could create different routines based on different times of the day, like morning routine, afternoon routines, or evening routines. This can help you anchor your day so if the morning isn’t good for you, but you feel better later you can just jump into whatever is supposed to be happening then. What mom doesn’t feel like she can do it all? We want to be supermom. We want to do it all. But let’s be serious, it rarely ever happens even on good days. More often, we just end up feeling super frustrated that we can’t do everything. So it’s time to get help. The first help could within your own family. Find ways that your spouse could help with the homeschooling, or even the kids helping each other. An older sibling could help a younger one with reading, or read to them. You could get a curriculum that teaches for you. Then you don’t have to be so hands on. Maybe you could hire help to either help with cleaning or help with schooling as well. Getting help will allow you to take care of yourself, and take some of the pressure off as well. Have a plan in place for flare days. If you wake up and know it’s not going to be a good day, knowing what will happen on those days will help you to take care of yourself, plus make sure your kids are getting the learning they need as well. If you create a routine for flare days, it will help your kids understand what happens on those days as well. It would be a good day to schedule some independent learning that your kids can do, like workbooks or watch documentaries or other fun educational videos on Youtube. You can have them draw something the learned from the videos they watched. Find simple things that will allow you to rest and take care of yourself while still providing the education they need. Homeschooling when mom has a chronic illness is totally doable. It will require that you plan ahead and be proactive about what happens on flare up days. There are plenty of educational resources available that students can do by themselves or with a computer. Knowing what you can and can’t do will help you to make the right decisions on what approach and resources will work best for your family. Homeschooling means you can customize to fit your exact situation. Make your home a learning environment so your kids will have multiple learning times throughout the day even if you never get to book work. Get help when and where you can. Whether it’s your kids, your spouse, or even just small things like having your groceries delivered, find ways to help yourself so you don’t have to do it all. 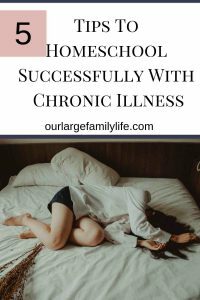 Having a plan will allow you successful homeschool your kids even when you have a chronic illness. Save these tips for later? Pin Here! What is your best tip for dealing with chronic illness?